Q: What are the key dates for Boiler MACT compliance? The final versions of what are commonly known as the Major Source Boiler MACT and the Area Source Boiler MACT were published on January 31, 2013 and February 1, 2013 respectively. For Major Source Boiler MACT, this publication established the start date of the three-year "grace" period to comply with the rule for affected facilities with existing units. Therefore, the compliance date for the Major Source Boiler MACT is January 31, 2016. 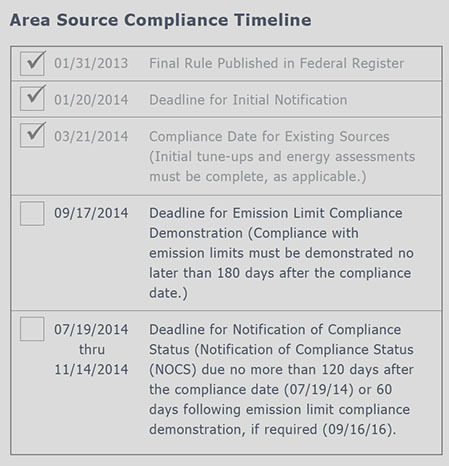 The U.S. EPA's grace period for existing sources subject to the Area Source Boiler MACT was March 21, 2014. For new sources (those that began operation on or after June 4, 2010), compliance is commensurate with start-up. Q: What has changed in the final Major Source and Area Source Boiler MACT legislation published in early 2013? From an overarching standpoint, Boiler MACT currently applies only to boilers in industrial, commercial or institutional service that burns coal, fuel oil, or biomass. In general, for those units affected by Boiler MACT, the emission limits are more stringent for about 30 percent, less stringent for close to 50 percent, and virtually unchanged for the remainder. This is based on the limits presented in the initial ruling in 2011. 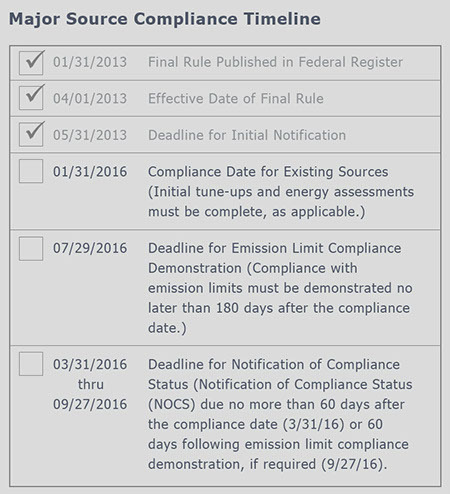 Q: What are the time-line milestones over the next two years that boiler operators need to know about regarding Major Source and Area Source Compliance? Q: How does a facility know if the Boiler MACT rule (both Major Source and Area Source) applies to them? Applicability is based on the facility's (not the individual boiler's) aggregate potential emission rate of HAPs (hazardous air pollutants). HAPs are a specific set of 187 different pollutants. With some exceptions, a facility's potential emissions are estimated assuming each emission source operates 24 hours per day, 365 days per year. Those facilities that emit or have the potential to emit, at least 10 tons per year (tpy) of a single HAP, or at least 25 (tpy) of a combination of HAPs, are "major" sources and subject to Major Source Boiler MACT. Otherwise, a facility is an "area" source and subject to Area Source Boiler MACT. An energy assessment is required for all existing boilers with a heat input limit above 10 MMBTU/hr at Major Source facilities. The energy assessment needs to be completed by a "qualified energy assessor". The EPA provides an example of "qualified energy assessors." You need to determine what you want out of your energy assessment. It might be simply checking the compliance requirements box or it might be viewed as a strategic assessment to help identify ways to save on energy. Many are using the Boiler MACT one time energy assessment requirement as being a conduit for better understanding how to save money and determine the remaining life of their boilers. They're taking this knowledge and factoring it into how it fits into growth plans, capital budgets and permitting issues. It goes far beyond just being a compliance requirement. The energy assessment is being viewed as a major business initiative. Q: How are "new" boilers being categorized in Boiler MACT and are there any special tune-up requirements? For both Area and Major Source boilers, new units are those that commenced construction after June 4, 2010. Existing units are those that commenced construction on or before June 4, 2010. The majority of new boilers are tuned up at start-up and are within compliance. There are 19 subcategories within the Major and Area Source categories for boilers and process heaters - 12 for Major Sources and 7 for Area Sources. Q: What are the sources that are exempt from regulation under the Major Source Boiler and Area Source ACT? capacity of less than 1.6 MMBtu/hr burning gaseous, liquid, or biomass fuel. 1Temporary boiler means any gaseous or liquid fuel boiler that is designed to, and is capable of, being carried or moved from one location to another. A boiler is not a temporary boiler if the boiler remains at a location within the facility and performs the same or similar function for more than 12 consecutive months. 3Gaseous fuels include, but are not limited to: natural gas, process gas, landfill gas, coal-derived gas, refinery gas, hydrogen, and biogas. Gas-fired boiler includes any boiler that burns gaseous fuels not combined with any solid fuels. A gas-fired boiler that periodically fires liquid fuels during periods of gas curtailment, has supply interruption, startups, or for periodic (not exceed 48 hours per year) testing is still considered a gas-fired boiler. Q: What are the cost consideration and implications for bringing a boiler into compliance? That is extremely difficult to predict. and will vary greatly based on the boilers/ boiler system that is currently in place. Industry estimates range as low as under $1,000 for a simple boiler tune-up to hundreds of thousands and potentially into the millions of dollars if it is a coal fired boiler. Q: What are the non-compliance fines and business implications? Specific fines are or actions associated with non-compliance are still being determined and subject to change. Q: Who can help with counsel and information assistance regarding Boiler MACT compliance requirements? You can use Victory Energy -- a leader in the design, manufacture and service of boilers and boiler room solutions for support and counsel, either direct through the factory or through our nationwide network of local representatives. We're experiencing and becoming intimately involved with many diverse Boiler MACT compliance situations and applications. We're rapidly becoming subject level experts. You can tap into this information base as well as our experience and expertise in the manufacture and service of boilers and boiler related equipment that will are integral elements in Boiler MACT compliance requirements.